The Residences of Orland Park Crossing consists of four mid-rise elevator buildings with one- and two-bedroom units averaging 980 square feet, and 63 rowhomes and townhomes ranging from 1,487 to 1,994 square feet. CHICAGO—The intense demand for rental apartments has also attracted a lot of investment capital to the multifamily sector. Buyers have even started to focus on value-add properties in the suburbs, and that in turn is forcing longtime players in that space to expand their own searches. “We have done a temporary pivot in our investment strategy,” David Carlson, a partner at Redwood Capital Group, LLC, tells GlobeSt.com. 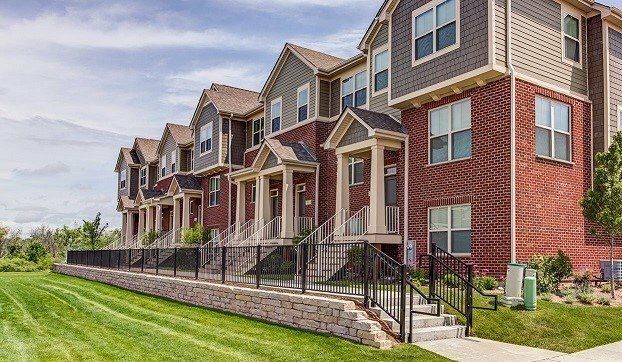 The Chicago-based firm is a national leader in the acquisition and renovation of class B workforce housing in the suburbs, but all the new money in the space has pushed down cap rates, and recently it began buying up well-located new construction. Redwood did just that recently when it acquired The Residences of Orland Park Crossing, a 231-unit apartment complex in Orland Park, IL, a Chicago suburb. The property was constructed in 2016 and the seller was REVA Development Partners, a Chicago-based real estate developer specializing in high-quality rentals, for-sale housing and mixed-use projects throughout the Midwest. The Residences of Orland Park Crossing consists of four mid-rise elevator buildings with one- and two-bedroom units averaging 980 square feet, and 63 rowhomes and townhomes ranging from 1,487 to 1,994 square feet. Residents also enjoy an array of state-of-the-art amenities including a clubhouse, pool, fitness center and views of the adjacent forest preserve. “The row homes and townhomes are 100% occupied because they are large enough to appeal to families moving to the area for the nationally-ranked schools,” says Bill McDougall, vice president of acquisitions at Redwood, noting that the local Carl Sandburg High School is ranked among the top 6% of schools statewide. “There could be an opportunity to convert the row homes and townhouses to condominiums if we saw the housing market was strong enough,” Carlson says. Best of all, the property is located in the heart of Orland Park, a large suburb approximately 25 miles southwest of downtown Chicago that provides all the amenities now demanded by affluent renters. The complex is adjacent to a 70,000 square foot Mariano’s grocery store, Starbucks and several restaurants. A number of malls and shopping centers are just minutes away, and the Orland Park 143rd St. Metra train station is across the street, transporting commuters to Chicago’s downtown in less than an hour. The company is close to completing a value-add deal in the Indianapolis region, along with another in SC. But in each of these cases, the deals will have an IRR about 400 bps higher than those for newly-constructed properties.